Aluminum slugs for capacitor shell is extrusion forming product, the capacitor sheet made from aluminum slugs has bright surface and accurate in size. The product has good stability, high impact current, strong overload capacity, low loss, high insulation resistance, non-toxic and no leakage for protecting environment. The aluminum slugs is mainly used for producing th eshell of capacitor in refrigerators, air conditioners, AC motors, pumps, generators, household appliances, electronic products and so on. Aluminum shell is a small size product, so the processing progress is very significant. In the process of aluminum slugs for capacitor shell, there are 2 aspects need to be concerned. 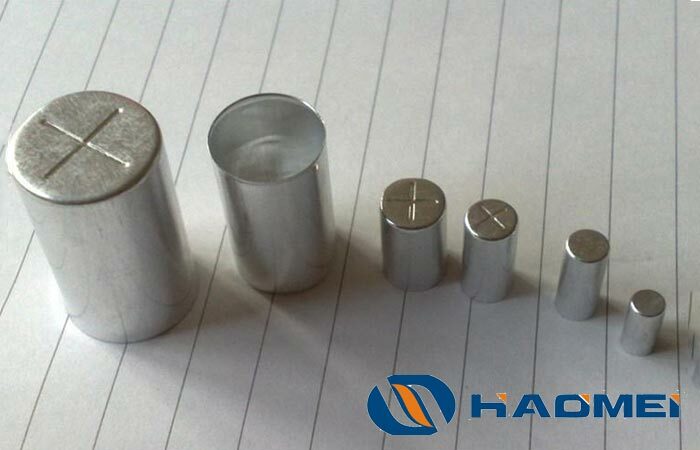 1, the raw materials for the processing of aluminum capacitor shell are all high quality aluminum slugs, the 1070 and 8011 aluminum alloy are often used. These raw materials can guarantee the surface treatment process and directly affect the service life and strength of the produced capacitor shell. 2, the processing equipment and technology. Processing equipment and technology are indispensable. Only guarantee the two can reach the process standard of aluminum capacitor shell. The advanced equipment can guarantee the specification standard, reduce the waste of aluminum slugs materials, and the high technology can guarantee the less defective products and improve the production efficiency.